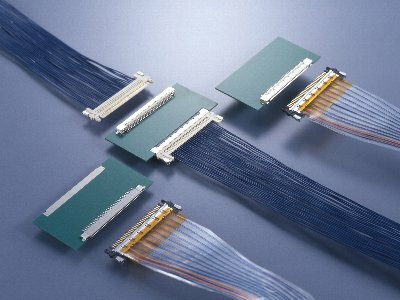 FI-X Series | Japan Aviation Electronics Industry, Ltd.
Board-to-Cable for high density packaging. Polarization for preventing erroneous mating. Friction lock type. (20, 30pos.) and Mechanical lock type equipped to lock-lever on cable side plug. Mating guide prevents misalignment when connecting. Easy to connect even when it is difficult to check visually. Pin headers come with hold-down for preventing float up when soldering and offering additional retention on board. The hold-down is incorporated with shell, enabling connection to the ground on board. Receptacle with a ground plate on both ends of wire terminal of contact, enabling connection to the ground on board. ZIF configuration for FPC. No force is directly applied when inserting FPC. Easy to operate. The shell is connected to the ground on one side of FPC when inserting it. Receptacles can be supplied in embossed tape.